Whether you’re an athlete or just lead an active lifestyle, there’s always a certain risk for sustaining an injury. Horizon Rehab’s orthopedic and sports rehab services not only help treat these injuries, but we also have programs to help prevent them from reoccurring or even happening in the first place. Whether you’re recovering from a surgery or replacement surgery for your shoulder, hip or knee, Horizon Rehab provides one-on-one rehab to help you regain your strength and stability so you can return to your normal level of function. If you’re dealing with pain or stiffness in your shoulder, the staff at Horizon Rehab is ready to help. We have staff trained in the Neil Asher Frozen Shoulder Technique. Frozen shoulder occurs when synovial fluid levels drop in the capsule in your shoulder. This leads to tightness and inflammation in your shoulder. 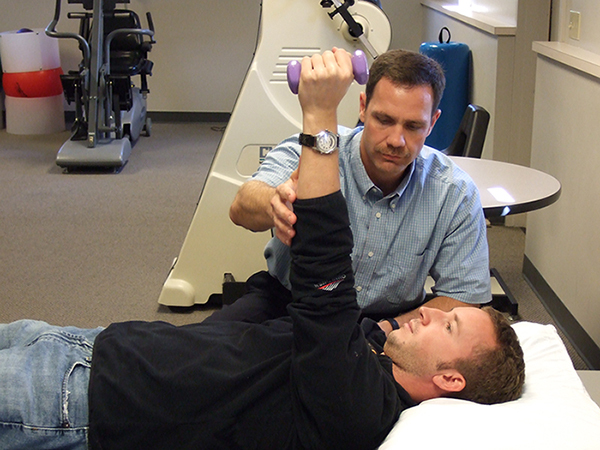 Using specialized “trigger-point” techniques that induce spasms in your shoulders muscles over several therapy sessions, our staff help reduce muscle tension and increase your shoulder’s strength, endurance and mobility. One of the most common injuries among athletes occurs when the knee’s anterior cruciate ligament (ACL) is torn. The injury can occur any time there is jumping and sudden changes in direction and happens in contact and non-contact situations. Horizon Rehab can evaluate young athletes to determine if they have an increased risk for sustaining a torn ACL and develop a treatment plan to help treat potential weaknesses, reducing the risk for ACL injuries. Whether sustained during an athletic contest or on the job, concussions need to be monitored and treated responsibly. Horizon Rehab works with physicians to evaluate patients until symptoms have disappeared and assist in determining when the patient can resume normal activities. In the case of athletics our team can recognize concussion symptoms, evaluate computerized test results and grade patients to determine when they are ready to return to play. There are several conditions that impact your feet, knees and hips that can be corrected with orthotics. Horizon rehab can fit you with custom orthotics are fitted to your feet and help make sure your bones are properly aligned. This helps your body heal injuries faster and makes other treatment more effective. Whether you’re working to rehab an injury and regain function or prevent a future injury, Horizon Rehab’s orthopedic and sports rehabilitation services can help. Contact us to schedule an appointment with one of our therapists.